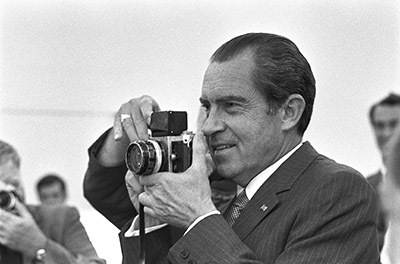 The Richard Nixon Presidential Library and Museum is located on nine acres in Yorba Linda, California on the site of President Nixon's birthplace. The permanent galleries reopened to the public on October 14, 2016. In addition to these newly opened galleries, the grounds include President Nixon's Helicopter and Birthplace. The Helicopter and Birthplace may be closed due to inclement weather, including rain, wind, and excessive heat. Please contact us on the day of your visit to inquire of their status. Use the information below to help you plan your visit to our museum, garden, helicopter, and birthplace. You can also find out about our exhibitions HERE and find answers to Museum Frequently Asked Questions! During Standard Time (PST), we close the Helicopter exhibit at 4:30 p.m. due to the site being too dark for tours. The Museum is closed on Thanksgiving Day, Christmas Day, and New Year's Day. From DOWNTOWN LOS ANGELES: Go south on Interstate 5 to Highway 91. Take Highway 91 east to Highway 57. Take Highway 57-North and exit Yorba Linda Boulevard. Head east (turn right) on Yorba Linda Boulevard and proceed to the Museum at 18001 Yorba Linda Boulevard. From LOS ANGELES AIRPORT (LAX): Take Sepulveda to Interstate 105-East to Interstate 605-South to Highway 91-East to Highway 57-North and exit Yorba Linda Boulevard. Head east (turn right) on Yorba Linda Boulevard and proceed to the Museum at 18001 Yorba Linda Boulevard. From SAN DIEGO: Go north on Interstate 5 to Highway 57. Take Highway 57-North and exit Yorba Linda Boulevard. Head east (turn right) on Yorba Linda Boulevard and proceed to the Museum at 18001 Yorba Linda Boulevard. From ANAHEIM: Take Katella Avenue to Highway 57. Take Highway 57-North and exit Yorba Linda Boulevard. Head east (turn right) on Yorba Linda Boulevard and proceed to the Museum at 18001 Yorba Linda Boulevard. From JOHN WAYNE AIRPORT (SNA): Head north on Highway 55. Merge onto Highway 91 and exit at Imperial Highway. Turn left and go north on Imperial Highway and proceed to Yorba Linda Boulevard. Turn left and proceed to Museum at 18001 Yorba Linda Boulevard. From RIVERSIDE and SAN BERNARDINO: take Highway 91 to Imperial Highway. Go north on Imperial Highway and proceed to Yorba Linda Boulevard. Turn left and proceed to Museum at 18001 Yorba Linda Boulevard. The Library is near the 131, 20, and 26 lines on the Orange County Transportation Authority (OCTA) bus lines; OCTA has trip planners and a system map available. 201 North Via Cortez St.